This is a Salad suitable for summer time. 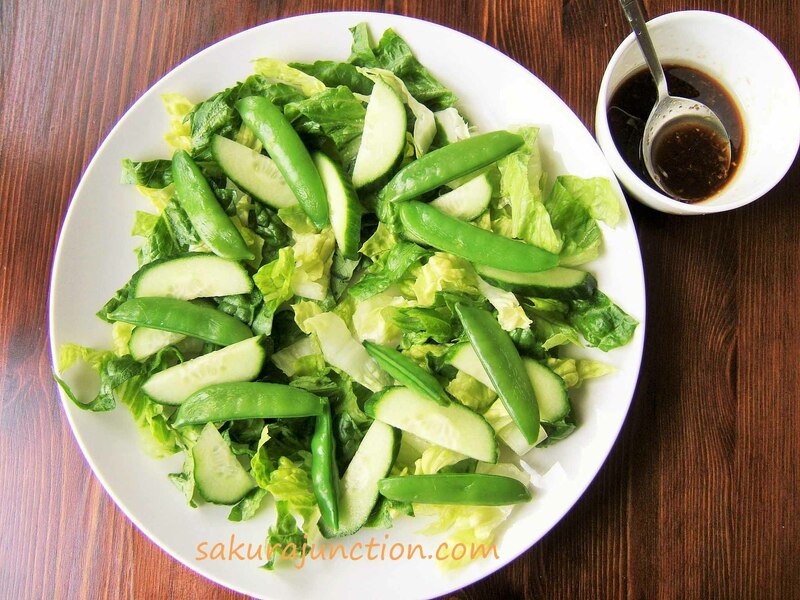 It is the Salad as a main dish when you want to eat lots of fresh vegetables/salad and also meat to energise the weakened body in heat. 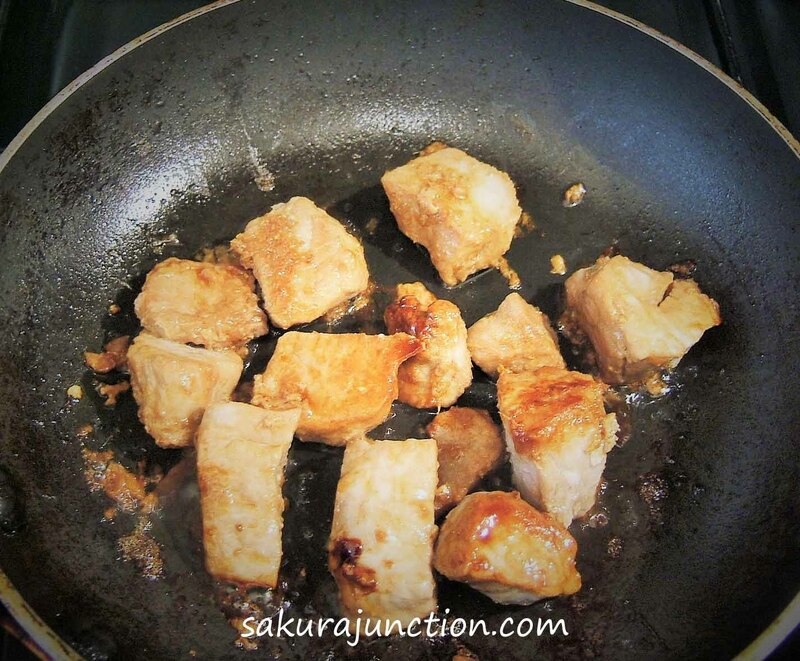 I had diced pork which is normally used for stew or curry but I did not want to cook anything for long time. Summer time cooking should be simple & quick. When I use Pork I always associate with ginger without a fail. Not just because the favour combination goes well, but ginger kill the porky smell. And most amazingly ginger has the enzyme which breaks down protein so that any meat becomes much more tender by marinating with it. 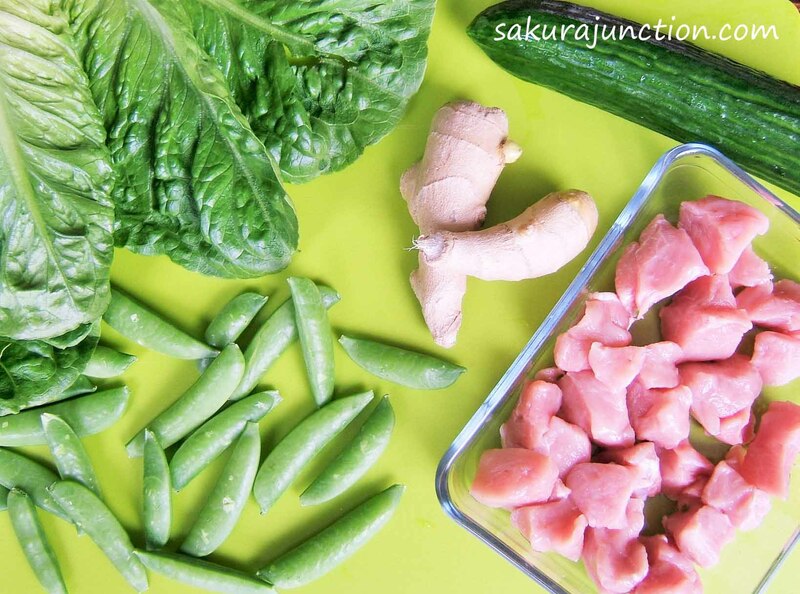 Also Ginger is famous for lots of health factors such as immune system booster, anti-oxidant or anti-inflammatory etc… So why not use fresh ginger more often? I used diced Pork this time but it can be with any shredded pork. You don’t need to use big amount of it either as long as there is enough dressing sauce to have with it. Cut or shred pork into the size you prefer and place it into a container with a lid. Add in grated fresh ginger, Soy sauce and Sake and mix well to coat the meat with the sauce. Place the lid and leave the container in a refrigerator for at least half an hour. Prepare Salad. Cut the lettuce, cucumber into the size you prefer. 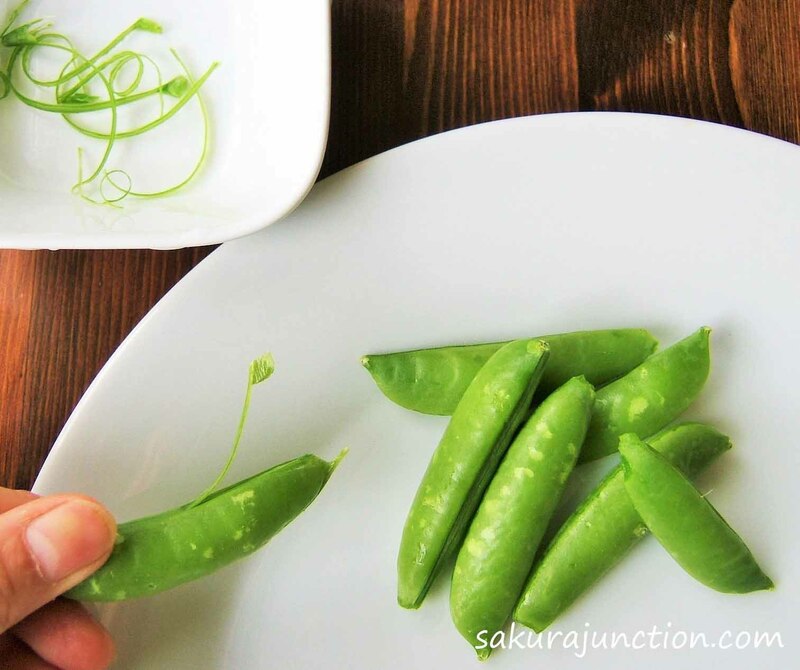 Steam Sugar snaps (or boil them with a tiny bit of salt). Remove them from the heat as soon as they become soft enough but still crispy. Place them in cold water to keep the fresh colour and strain them. Plate all the salad ingredients on a plate before starting to cook the pork. Mix all the ingredients for dressing too. Shred some carrot and ginger into Needle shape for garnishing. Heat a flying Pan with Vegetable oil and place the pork pieces into the flying pan. But keep the marinate liquid in the container. Cook one side of pork with medium heat and turn it over when the bottom side becomes brown. After cooking the other side for a minute pour the marinate liquid into the pan and place a lid on the flying pan. Turn the heat to low and cook the meat thoroughly until the pork becomes brown and coated with the caramelized sauce. Place cooked pork and the caramelized sauce on top of the prepared salad and pour the dressing sauce over it as well. Garnish it with needle carrot and ginger. Voila! 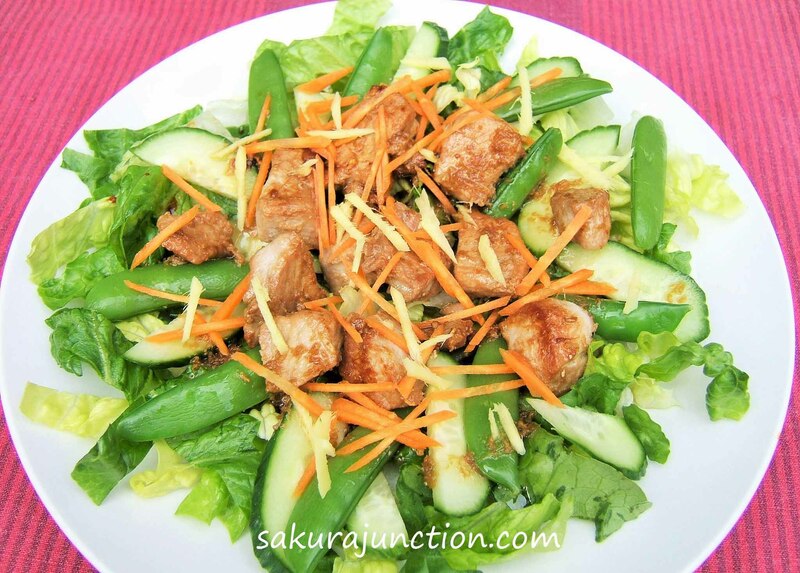 Ginger Pork Salad. 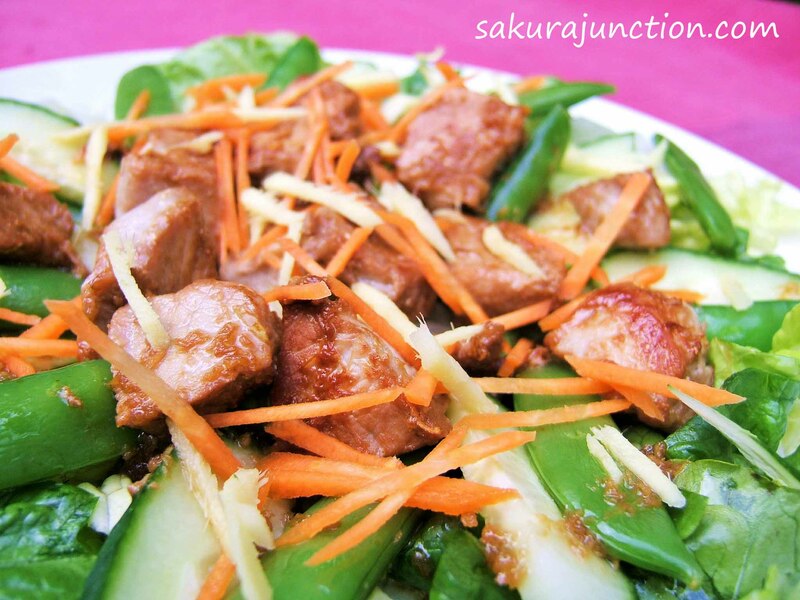 Pork flavour goes well with lettuce and cucumber but you can use any salad ingredients you like. Something to think about making for lunch today!